As the crypto industry continues to garner mainstream adoption, the hundreds of exchanges in operation today play a significant role in how the world perceives crypto. While there are many exchanges today that operate with integrity and vision, unfortunately there are quite a few bad faith actors that hurt the trust of this growing but still nascent community. Here are nine ways in which the industry is currently abusing users trust. Though many crypto exchanges are doing their best to operate ethically, the reality is a handful of exchanges were launched with the sole purpose of making money at the expense of users and communities. Without uniform regulation for exchanges throughout the world, it’s inevitable that unethical exchanges continue to operate fraudulently while also hurting the global cryptocurrency brand. Recently, South Korean crypto exchange UPbit was charged formally for engaging in billions of dollars of fake orders. From a business standpoint, the lack of regulation puts legitimate exchanges in a difficult position. Exchanges looking to maximize profit at all costs can do so with little to no repercussions, while above board exchanges struggle to keep up while playing by the rules. There’s no way around it: lack of regulation encourages market manipulation, and those who believe in the industry must do what they can to win users’ trust. Lack of regulation doesn’t just encourage manipulation; it also allows exchanges to operate without the proper systems in place to deliver an excellent experience. As such, the vast majority of exchanges are unreliable, and downtime is all too common. Worse, for those who trade often, experiencing server issues in the middle of a trade is a common occurrence. While growing pains in a relatively new industry like crypto are to be expected, as an industry we must work towards delivering a reliable product that performs trades as you would expect. At EMX we use an innovative auction-based matching engine which is significantly more scalable in terms of reliability compared to other current exchange offerings. We believe it’s important for our users to be able to use our platform without any hiccups or issues. Reliability issues aside, lack of regulation also means that many of today’s crypto exchanges can skimp on security best practices without consequence. This means that large scale hacks are a regular occurrence in our industry. In 2018, there was reportedly over 1 billion USD stolen in crypto among exchanges around the world. Though no financial industry is immune to hacks, for crypto to be considered a viable investment by large institutions and high net worth individuals, we must begin to take exchange security much more seriously. EMX uses multi-signature cold storage to protect our users assets as well as personal information. Additionally, we are committed to following strict KYC/ AML guidelines to further enhance the overall security of our platform. Traders and investors of crypto should have the reasonable expectation that their funds are in good hands before, during, and after their trades. While not directly correlated with lack of regulation, many exchanges today are put together with no thought of the end user in mind. Even for experienced traders familiar with the general UI of a standard trading platform, it can be incredibly difficult to understand how each platform works. A lack of thoughtful design isn’t just frustrating to use - in some cases, it can lead to users losing significant amounts of capital when a feature of the exchange doesn’t function as expected. For example due to poor user design, a trader may believe they are putting in a buy order lower than the current price of an asset, only to realize that the exchange had them market buy at the current cost. We believe the user experience of our exchange is so important, that we’ve invested in hiring world class designers and engineers to produce an exchange that is functional, sleek, and intuitive. Despite the simplicity of our design, EMX provides the advanced trading features that traders need. To try it out yourself, head to https://testnet.emx.com. Again, for crypto to continue growing as an industry, it’s crucial that exchanges begin taking the design of their platform seriously. While it’s to be expected that exchanges will have issues on occasion, bugs and random errors are currently the norm for many trading platforms. It’s incredibly frustrating when trying to perform a trade to see the dreaded “error” message with no further context. Additionally, error messages are often common when depositing and withdrawing cryptocurrency, which can lead to unnecessary stress regarding the status of one's financial assets. EMX is currently working to have a 3rd party audit our security systems to ensure that our infrastructure operates under the best practices for exchange security. We are also in the process of launching our bug bounty program to leverage the power of our community so that bugs are both noticed and fixed quickly. Crypto is now a decade old industry. It’s no longer acceptable to blame bugs on lack of information or adequate tech. it’s crucial that these minor annoyances are taken seriously. In addition to dealing with constant bugs and error messages, traders around the world are frequently exposed to terrible customer service across the board. Exchange not showing your funds? Wait 2-3 weeks before you get a generic email reply. Can you imagine if that level of customer service was tolerated in traditional financial markets? Unfortunately, customer service from many exchanges today isn’t just slow, many of the reps hired by leading exchanges show little to no empathy, and often prescribe cookie cutter solutions that simply don’t work. EMX is committed to delivering exceptional customer support and will work towards offering 24/7 multilingual support in key languages after launch. We not only want to help our users around the world resolve their issues, but do so at an industry leading pace. When you deposit your funds to an exchange to trade, you’re doing so with the expectation that your funds ultimately remain yours. However, as we’ve seen time and time again, exchanges often use user funds without explicit permission and often lack transparency with regard to their terms of service. After the founder of popular Canadian exchange QuadrigaCX recently passed away without sharing the companies private keys, the exchange turned to its current users to help cover the exponential losses suffered without their permission. We currently work with Bitgo for custody; they process over 15 billion USD a month in transactions and have a strong track record for their security solutions in institutional markets. The private keys of our exchange will be accessible to 2-3 key individuals at EMX and will never be shared with anyone else. Another way in which exchanges are abusing your trust is by charging exorbitant fees that aren’t in line with fees that are accepted in traditional financial markets. Because certain cryptocurrencies are only traded on smaller exchanges, these exchanges have the leverage to then raise fees with consumers having no other choice but to accept the high fees. Yes, exchanges such as EMX need to charge fees to build a profitable business, but in many instances, the fees are significantly higher than in other financial markets. Exchanges need to charge reasonable fees for the services they offer and not take advantage of users who may be new to trading in general. In no other industry do we allow for seemingly reputable exchanges to get away with their lack of transparency regarding their terms of services and fee structure. At EMX we want to be known for our fair and transparent fee structure. We’re currently offering the best maker rebates in the industry, as well as competitive taker fees. For more information about our fees, check our contract specifications in our Help Center. Additionally, one of the biggest issues for traders today is the need to have to transfer their funds to up to a dozen different exchanges before being able to make their desired trade. Not only is this practice time consuming, but it also eats significantly into any potential profits a trader may have realized. We believe that exchanges owe it to their communities to offer as many trading options as possible all under one roof, which is why increased regulation in crypto is so important. Increased regulation will inevitably allow for more liquidity for a wide variety of assets. As regulation continues to grow within the space, we’ll begin to see more and more exchanges being able to offer more products and services legally. 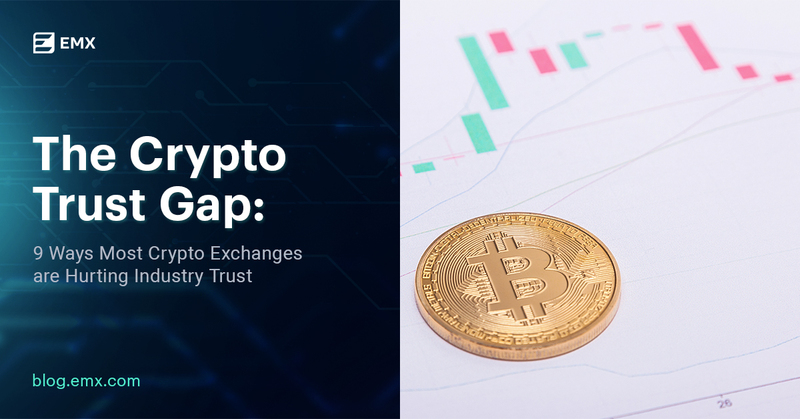 While there are currently many issues that are negatively affecting the perception of exchanges within crypto, we have no doubt that as our industry continues to mature, the leading exchanges will have no choice but to improve their services. At EMX we take pride in helping set the standard of how exchanges should operate, not only by abiding by the best security practices, but by always putting our users and community first. Though we have a long way to go before crypto’s reputation can be fully repaired, we are excited to be a part of the continued innovation of crypto and welcome any and all competition that helps push EMX to grow, evolve and improve.